Jinja, Kampala and Mbarara. Info for independent travellers. If you are planning a budget trip in Uganda, here you can find useful information to visit Jinja and surroundings, and a few things about Kamapala, in a independent and low-cost trip. Around 80 km east of Kampala, on Lake Victoria and 150 km from the Kenya border, is Jinja, the industrial town of Uganda. Most of the tourists stay around the Nile river, not in town, where they´ve created the East Africa activities capital. Why? Because the British said Jinja was the “Source of the Nile river”. Poetic place to attract tourists. Jinja has 3 very different parts. A busy and ugly commercial center (around Main Street, Civic Road and the market), with some “old” colonial buildings. Many streets look destroyed, full of potholes, but there´s a new and huge market building. 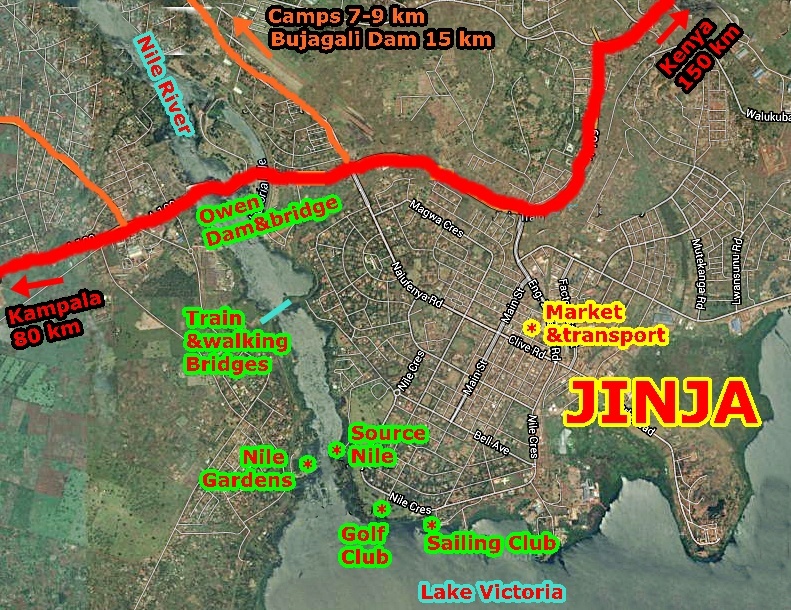 The second Jinja, more residential and tourist area around the Nile source, west of the center. It´s nicer, quieter, with restaurants, bars and special places for “mzungus”. Many colonial houses are empty, others are expensive hotels. 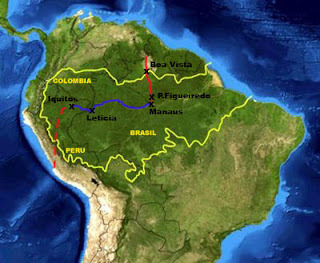 And the third area, in the surroundings, is where many factories are (breweries, sugar, textile, etc.). And then down the river, tourist camps (5-9 km away). The bad thing for low-cost travellers in Jinja, is that cheap accommodation in the center, is quite limited and bad, not too many options, the places are too basic, noisy and not so clean.Tourist camps are a bit far and more expensive. We didn´t see buses in Jinja, it seems that most of them just pass the highway and don´t go down to the center a few km away. There are many vans and minibuses going to main towns around this part of Uganda. If going to Nairobi, maybe easier to go to the main road. Ask around. Boda-bodas, many, at every corner. Minimum 1.000 Sh. Boda-bodas are the easiest way to get there. Around 5 to 9 km so it shouldn´t cost more than 4.000-5.000 sh, agree with the fare before. Try to ask if there are also matatus going to the Nile area as there are villages around. Keep in mind that outside the main roads and streets, there´s no asphalt and the roads and streets are really in bad conditions. Plenty of matatus-vans (5.000 Sh) and minibuses (4.000 sh) heading to Kampala (3 hours, depending on traffic). They usually depart from the taxi-park (market) or around and also matatus stop on Civic Road at the petrol station. Matatus-vans to Mbale (10.000 Sh, 3 h), departure from the taxi-park (market) and surrounds. Ask. We didn´t wait, the matatu got filled on the way. Also matatus going to Soroti, Tororo-Malaba (Kenya border), Busia (Kenya border). Not too many options in the center, just a couple of expensive hotels and a couple of really basic ones. Victoria View Inn; where we stayed, but we can´t recommend it. Price: 25.000 Sh for a double self-contained room. Very basic and not too clean, the bathrooms are quite broken. The location is just behind the market, near the taxi-park, but the rooms facing the yard are calm. As the cheap offer in the center is quite limited and bad, there are a few backpackers camps, but most of them in Bujagali not in Jinja´s center, a few km away, but some have also a branch just outside the center. 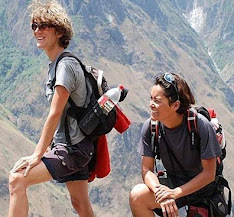 Most of the camps manage the adventures companies too. You can check online as most of them have websites. Many banks (main street), internets, pharmacies. Many supermarkets, shops, big market. For food&drinks, big offer but not always to "bright", better to go to the southern part of the Main Street, with local restaurants, bars and also special places for “mzungus” in old colonial buildings. In fact, not too many things to do, even if you read it´s on Lake Victoria and the Source of the Nile, the place is quite normal. If it was not the famous Nile probably nobody will stop in Jinja, except maybe people wanted to do expensive adventure activities (rafting, etc). Walk around Jinja town. All the area close to the Nile River is a residencial area, quiet and without traffic, with colonial style houses with gardens; some are still inhabited, other “okupy” by African poor families and other abandoned. It´s just close enough to the center, but you can also take a boda-boda if you don´t want to walk. See Lake Victoria and the Nile River area, from the Jinja Sailing Club (no entrance fee), and follow the Golf Course (no fences, it´s open). Up from the river, some view points. The "Source of the Nile" is just there. You can keep on walking til you reach the train bridge and cross the walking bridge underneath. We tried to do some picture but a policeman came and told us pictures are forbidden here. Owen Falls Dam: when coming from Kampala, you will cross the dam and the Nile. But no more falls! Now Bujagali Dam is finished, so don´t expect to see the falls anymore there too! Jinja is the “East Africa adventure capital”, so you have many activities to spent your money. We didn´t do any, too expensive for us! But here´s some information. The Source of the Nile River (10.000 Sh fee for foreigners) is just behind the golf course. On the other side of the river, there are also Nile Gardens (entrance fee too). Both are just restaurants and tourist traps, where you take the photos of the “Source of the Nile”. Same views from outside. Nothing special! Rafting the Nile: downstream, Jinja is famous for that: But now with 2 big dams, things´ve changed. The rafting companies have now moved the embarkation points 8 km down the dam, and maybe the rapids are not the same anymore. Different companies. The prices are around 125-150 $ for a full day, most of the times they include transport from Kampala/Jinja and maybe one night accommodation in their camps. 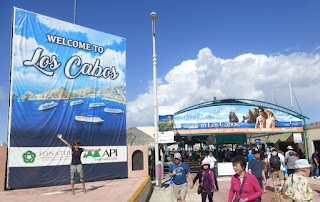 Kayaking, bungee jumping (Adrift), horses, jetboats (Adrift), mountainbiking, tubing, quads, horses, fishing. But quite expensive... Down the Nile river, 10-20 km from Jinja, camps. Queen of Africa cruise. Price around 100 $ (2h), located at Wildwaters Lodge (a luxuru lodge, off Kayunga Rd, 30 km from Jinja). “City of 7 hills”? There are many more, that was maybe 100 years ago, now there are nearly 2 million people who live around Kampala, in a huge populated area. The center looks like a city with a few high buildings and streets, but the rest of Kampala is more an addition of neighbourhoods, with a village feeling, very spread out around at least 10 km from the center. Once more, we find Africa cities out of interest for travellers, not many reasons to stop there for too long, but if you are looking for expats restaurants and clubs, Kampala can be a good place, but propably a quite expensive experience! Note: we just passed quick the center in a van and stayed in a suburb, where we did Couchsurfing. The main bus stations and taxi-parks are in the center. Also around the bypasses (big roads that circle the city) there are stops and parks, great if you want to avoid the center and just transfer, it´s easy to catch a van going to Jinja, Fort Portal, etc., main Uganda towns. Just ask the van´s drivers. Helpful. Boda-bodas: everywhere in the city. It can be risky as the traffic is heavy and the roads narrow and bad. From 1.000-2.000 Sh. Vans: on the main roads. Prices from 500-1.000 Sh. International coaches: depatures from the center (offices, different companies). To Nairobi, Dar Es Salaam, Kigali, Bujumbura, Goma. Long trips! International Airport: in Entebbe, around 30-40 km from Kampala. But it can take 1 to 2 hours or more. Take it easy! There are matatus. Traffic in Kampala: bad reputation for the traffic jams. Main roads get busy, specially at rush hours. Try to avoid this time if possible. Note: they are building the new toll highway Entebbe-Kampala (it should continue latter til Jinja). Local lodges around the center, close to transports. Kampala has also a few “backpackers”, in the suburbs (3 to 5 km from the center). Not as cheap as local lodges, as camping is around 15.000-20.000 sh/pp, but probably nicer places if staying a few days around. Couchsurfing in Kampala: there´s an active community, not so big, with many foreigners and also a few local people. We stayed with Nicole from China. Thanks! Everything needed, capital city. Many expats. Many embassies. Note: if travelling to Ethiopia, it seems that the Ethiopian Embassy in Kampala is as tough as the Nairobi one and they don´t do visas to travellers, only to residents… Good luck! The biggest town in southern Uganda, the center is ugly, just a few noisy, crowded and dusty streets. A break on the road if tired (on the way to/from the south or Queen Elizabeth NP) or nothing to really stop you here and it´s better to skip this town. Banana plantations around and cow-beef farms, hilly area, populated. - Kabale-Mabara: 15.000 Sh, 3 h, bus (140 km). Also many taxi vans.Tarred road. Some works on the road just south of Mbarara as they are building a new and bigger road. - Mbarara-Kampala and main south Uganda town: lots of buses, taxi vans and shared taxis. Mainly Kabale, Kasese, Fort Portal, and also towns near Queen Elizabeth and Bwindi north. - The taxi park is dusty and crowded, but it can take a while to fill the vans. Be patient, it´s just luck. Bus station is just close. - Mbarara-Kasese (tarred road): there are a few towns on the road between Mbarara and Ishaka, all with small lodges. Ishaka, west of Mabarara on the Kasese road, is tea area, really beautiful plantations around. Then the road goes down from the green hills to a flat savanna area, the Queen Elizabeth National Park surrounds. Great views from the road going down, Rubirizi to Kichwamba. It´s a big town and there are many hotels spread out in the area. We saw a few lodges in the center, but probably noisy and basic, so check before. Couchsurfing in Mbarara: There´s a very small active community. We stayed in the suburbs with Sang from Korea. Many local restaurants all over Mbarara, shops. Also bigger supermarkets in the center, like Nakumatt. Nothing really. The surrounds are just banana plantations and farms (you can see the Ankole cows, but there are in all southern Uganda. Small savanna park, 50 km east of Mbarara on the Masaka-Kampala road (access via Sanga, Kagate). Entrance fee 40$/pp. Birds, zebras, antelopes, buffalos, leopards, hippos. We didn´t go.